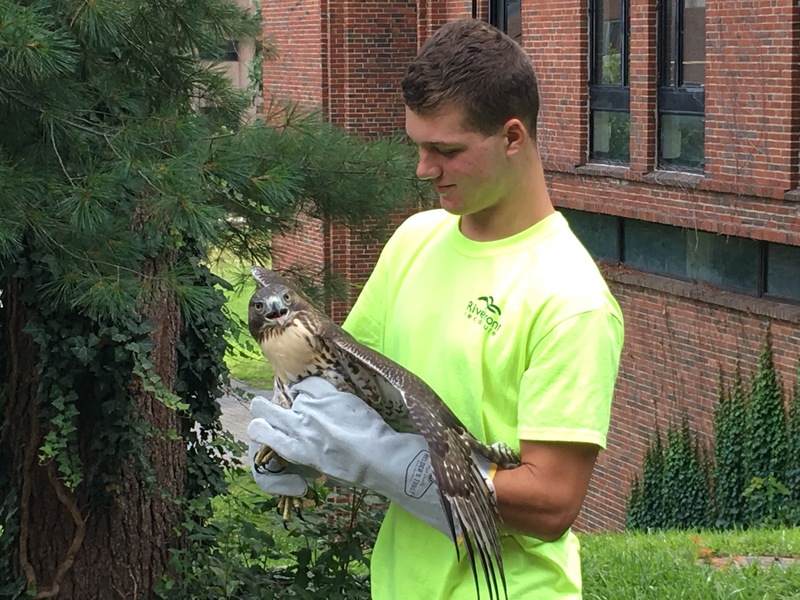 Urban Ed @ Trinity CollegeConnecting people that learn, work, and live in Hartford, CT.
On Monday, July 17, Hartford Magnet Trinity College Academy (HMTCA) science teacher Jared Lewis noticed an injured red-tailed hawk near McCook Hall at Trinity College. Lewis was on Trinity’s campus for the HMTCA summer science program. He called Campus Safety and Robert Cotto, Jr., the Director of Urban Educational Initiatives, at Trinity College. And that led to a team of people working together to help the injured raptor. The young hawk was hopping around on the ground near McCook and trying to avoid people. Upon further inspection, it appeared the hawk had an injured left wing. Unsure of who to contact, Cotto and security officers Jeff LeBreque of Trinity College and Edwin Santiago of Hartford Public Schools made several calls to local bird rescue centers. The State of Connecticut’s Department of Energy and Environmental Protection website offered these contacts as suggestions of people trained to handle distressed birds. Finally, Grace Krick from “A Place Called Hope” raptor center answered Cotto’s call. Being in Deep River, CT, which is almost an hour away from Trinity College, she asked for pictures of the injured hawk. Within minutes, Grace had a volunteer, Nick D’Onofrio, in the Hartford area at Trinity College to collect the bird. Nick safely collected the young male hawk and without too much distress. If the hawk can be quickly rehabilitated, then it will be released back near Trinity College. But it is likely that the hawk will be released to another location so it does not directly compete with its adult kin for food and space. Red-tailed hawks are territorial by nature. A decade ago, there were very few urban red-tailed hawks. Now they are all around Hartford, including around Trinity College. Being in such close proximity to people, the red-tailed hawks can face a variety of dangers. But that also means they can sometimes get a helping hand, or wing. Great job Nick and all those who helped!